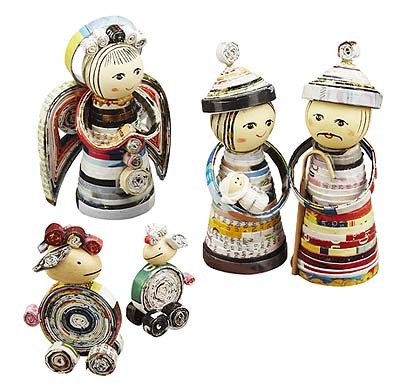 Bright nativity figures in Vietnamese hats are shaped from circles of recycled newsprint. 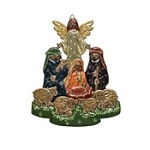 The Holy Family, two sheep and an angel celebrate “good news to all people.” Decorative only. Keep out of reach of children. Adapted from a traditional basket-making technique, this set is made using recycled magazines and posters discarded from a printing company. Artisans in Ho Chi Minh City, Vietnam, form paper into flat strips, dip them in a glue mixture and hang them to dry. After this they re-wet strips and coil them into a bowl form. The strips are held together with glue, forming sturdy figures.